The Guest Editors have assembled an international list of top experts to present the most current information to pediatricians about patient safety. The issue has a primarily clinical focus with a few articles addressing the business and practice of patient safety. 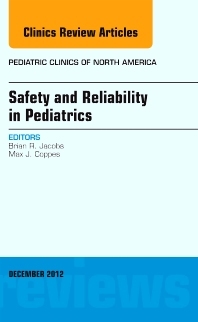 Articles are devoted to the following topics: Developing performance standards and expectations for safety; The role of CPOE in patient safety; The role of smart infusion pumps on patient safety; Abstracted detection of adverse events in children; The role of effective communication (including handoffs) in patient safety; Reducing mortality resulting from adverse events; Optimizing standardization of case reviews (morbidity and mortality rounds) to promote patient safety; Impact of (resident) duty work hours on patient safety; Role of simulation in safety; The role of diagnostic errors in patient safety; The role of collaborative efforts to reduce hospital acquired conditions; Patient safety in ambulatory care; Role of FDA and pediatric safety; and Patient safety through the eyes of a parent.